Drew's Blog: Is the Universe Teeming With Extraterrestrial Life? Is the Universe Teeming With Extraterrestrial Life? Randall Munroe, of xkcd fame, has been obsessed with this idea that the universe is brimming with other life, and the fact that there isn't much evidence for it. This is known as Fermi's Paradox. There are over 10^11 stars in the Milky Way galaxy alone, and over 10^22 stars in the observable universe. Our galaxy has had 13 billion years to produce spacefaring civilizations. Even if only a very small percentage of those planets is capable of producing life, certainly we would have found evidence of this by now. Of course, this assumes that the Earth is just a typical planet, that there is nothing special about it or its inhabitants. This is called the mediocrity principle. So why would I care whether or not extraterrestrial life exists, let alone whether or not anyone else believes in it? There's nothing at stake religiously. Theism is perfectly compatible with extraterrestrial life. The Bible is silent on the issue (although technically, angels are extraterrestrial beings), so even a Biblicist Fundamentalism is not at odds with a universe brimming with extraterrestrial life. So why then do I care enough about this issue to post on it? I'm not sure I fully understand it myself, but among metaphysical naturalists like Carl Sagan, it seems necessary to their view that the universe contain abundant extraterrestrial life. So what's at stake here is the mediocrity principle itself. If it is not true, then such evidence would suggest that we are not the products of random chance, but were designed, and the metaphysical naturalist certainly can't have any of that! What are the odds that extraterrestrial life exists elsewhere in the universe? Carl Sagan believed that it was very high, because he thought that only a few factors were necessary for life to exist, such as right distance from the star and the presence of water. Modern cosmology has advanced significantly since Sagan's days. The first issue is: what kind of life are we talking about? I am going to define life as "self-replicating organisms that can adapt to their environment, respond to stimuli, and use some sort of metabolism." There are three known elements that are candidates for being a base for life: carbon, silicon, and boron. Robert H. Dicke noted various problems with silicon and boron. Silicon is capable of forming far fewer configurations than carbon. Silicon cannot form strings of more than about 100 amino acids, far too short for anything like DNA to form. Boron has other problems: everywhere in the universe, it is enormously scarcer than carbon, and in concentration is toxic to certain life-critical reactions. This is why Dicke deduced that if one wants any sort of advanced life, it must be carbon-based. Since the 1960s, the list of parameters necessary for a planet being able to sustain life has grown from two to over 320. As science advances, its understanding of what a planet needs to sustain self-replicating molecules has made the prospects of extraterrestrial life increasingly grim. In fact, the probability that any given planet has the conditions necessary to support life is around 1 in 10^304. There are around 10^22 stars in the observable universe. Therefore, the probability that any planet anywhere in the observable universe has the ability to sustain life is around 1 in 10^282. Compare that to the chance that you will be killed while reading this blog post by a sudden reversal of the second law of thermodynamics, which is around 1 in 10^80. What About An Actually Infinite Universe? Has the existence of extraterrestrial life in the universe been shown to be a near certainty as Amir D. Aczel argues in his book: Probability 1? Aczel assumes the probability of life existing on any given star system is 1 in 10^14 (a figure that Aczel admits is his own arbitrary guess), that intelligent life will inevitably evolve out of primitive life, and that we are the most advanced civilization in the universe. These are assumed without argument. But let's examine the argument from Amazon's review page: "In an infinitely large universe, what is the probability of intelligent life on another planet?" It seems to be a certainty. But is it possible that we live in an infinitely large universe? Can an actually infinite number of things exist in reality? I think the very notion is self-contradictory. I addressed this issue in the Kalam Cosmological Argument, but let's briefly go over the issues with actual infinites. If I had an actually infinite number of marbles, and I gave you half, I would be subtracting actual infinity from actual infinity and end up with actual infinity. If I had an actually infinite number of marbles and I gave you all but 3, then I would be subtracting actual infinity from actual infinity and ending up with a finite number. If I instead gave you all marbles, I'd be subtracting actual infinity from actual infinity and ending up with zero. In all cases, I am subtracting identical quantities from identical quantities and getting different answers. The distance between any two points can be divided in half, and then in half again, on and on without limit. This is a potential infinite, not an actual infinite. To presuppose that any distance is composed of an actually infinite number of parts is begging the question. The main issue with an actually infinitely large universe is that the universe is not infinitely old. Both the expansion rate and the background radiation show that the universe began to exist about 14 billion years ago. But this creates an insurmountable problem for any proponent of an actually infinitely large universe. Exactly how much mass did the universe contain the moment after the big bang? It would appear: infinite. But how does an infinite mass even expand and not just collapse into a black hole? Further problems: exactly how quickly does an infinite universe need to expand in order to cross the threshold from finite size to infinite size, and when did the universe cross this threshold? The red shift in the other galaxies shows that they are receding from us at a finite rate. In fact, astrophysicists can observe the universe at different stages of its life. If the universe expanded at an infinite rate, why are other galaxies observable? The odds are virtually nil that any other planet will by chance alone be able to support life. If there does exist life elsewhere in the galaxy, it would be evidence of design. But what if other life was designed elsewhere? 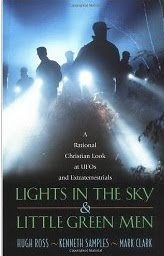 Could it explain UFOs and close encounters? The mere existence of extraterrestrial life does not mean that extraterrestrial visitors are the cause of UFO phenomena. For any extraterrestrial to visit us, it would have to overcome the problem of traveling from some distant star system to Earth. In order to reach Earth, extraterrestrial life would have to travel at least hundreds of light years. SETI has eliminated all star systems within 155 light years of Earth as candidates for supporting extraterrestrial life. In order to transport life across these distances, there is a problem keeping them alive. Outer space contains an enormous amount of radiation and debris. The faster you travel, the greater the damage any craft will sustain, proportional to the square of the craft's velocity. Every time you double the speed, the damage goes up four times. For even the most heavily armored ultra high tech spacecraft, the maximum travel speed will be about 10% the speed of light. Here's the problem. One speculation for overcoming the time it takes to travel to distant galaxies is to rely on time dilation. When an object is moving close to the speed of light, time slows down. If you could reach speeds very close to the speed of light, a trek from one star system to the next may take a million years, but only seem to the inhabitants of the space ship like it took a few hours. If you can only reach speeds around 10% of the speed of light, time dilation is negligible, so a 1550 year journey will seem like around 1550 years. Can Wormholes Circumvent the Travel Problem? A wormhole is a black hole singularity attached to another black hole singularity, where the tails connect. The odds against the tails of these two black holes ever connecting is very remote. The odds of two connected tails remaining connected for any length of time is also remote. Finally, nothing larger than an electron can travel though a wormhole. In an if a then b statement, modus ponens says "if a is true, then b is true." Modus tollens is the reverse, saying b is false, then a is false. And why should the mediocrity principle be true in the first place? Metaphysical Naturalism and Causal Closure: Why Presuppose Them? Metaphysical Naturalism - a world view and belief system that holds that there is nothing but natural things, forces, and causes of the kind studied by the natural sciences. Causal Closure - No physical event has a cause outside the physical domain. I believe that the main reason that the mediocrity principle is asserted in the first place is to protect these two views. If the mediocrity principle is false, then one has to deal with the very real possibility that nature itself was designed by a supernatural entity or entities. Is there any good evidence that either of these notions is true? I have only come across one argument for either of these notions that does not beg the question, and that is the argument from the success of science. This argument states that the methodology of science, which presupposes that natural effects have only natural causes, has been so successful, that one is justified in asserting that this presupposition is true. I beg to differ. Suppose a scientist mixes one gram of salt into a glass of water. A miracle (physical event with a cause outside the physical domain) occurs and the amount of salt in the water doubles. The scientist boils the water and finds out that two grams of salt remain. What will the scientist conclude from the experiment? Do you think he will conclude that a miracle occurred, or that, perhaps, he messed up the experiment and forgot to use de-ionized water? Let's say that these anomalies occur repeatedly. Would a scientist then conclude that something supernatural is occurring? In 1979, two mental magicians, Banachek and Michael Edwards, tricked psionics researchers at Project Alpha that the two really had the ability to manipulate objects such as cameras with their thoughts. While the researchers thought they had a confirmed case of psychic powers, they believed these phenomena were due to naturalistic brain wave activity, not anything supernatural. So What Are These Encounters, Anyway? About 95-99% of UFOs have natural explanations. They're really identified objects, such as meteors and the planet Venus. Others are military aircraft, and a few are even hoaxes. What about close encounters? Another possible explanation for these encounters is visitation from beings outside our universe. Given the likelihood that the universe is not a closed system under physics, I believe this is the most plausible explanation. There are thousands of reports of close encounters, and most of them result in some sort of physical or psychological injury. Objects have been reported to defy the laws of physics, disintegrating and then reassembling, or blacking out radios without any detectable electromagnetic emissions. The common denominator among these encounters is involvement in the occult. Virtually all close encounters are experienced by individuals involved in spirit channeling and mysticism, astrology, tarot, and crystalology. It is not the astronomers who log thousands of hours each year looking at the night sky who experience such phenomena. The technological knowledge of these visitors seems to be advancing at the same pace as modern science, slightly ahead of lay knowledge, but slightly behind the knowledge of physicists. And this is where the irony sets in. The atheist who mocks the idea of supernatural encounters still might believe that we have overwhelming evidence that we have been visited by extraterrestrial life. But the argument in this panel applies just as well to reports of and visitations by supernatural entities! In other words, there is plenty of credible evidence of supernatural events to anyone who wants to believe.